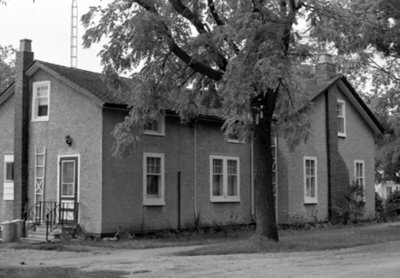 A black and white photograph of 57 Cassels Road East (Mill Street). The view is from the side of the house. This is one of the oldest houses in Brooklin and was originally a frame house that has been stuccoed over since the 1950’s. It was owned by Richard T. Harrison, a former Whitby Township Clerk who died in 1882. In 1927, Mrs. R.S. McLaughlin bought it for her parents, Mr. & Mrs. Ralph Mowbray. Winter, Brian ; Mowbray, Ralph R.
57 Cassels Road East (Mill Street), July 1975, Brian Winter. Whitby Archives A2013_004_032D.